Image: Mary, Queen of Scots, Death Mask. CC2.0 photo by Dave McLear. Good things come, right, Mama? Not to those who work, like you said, but to those who wait. My step-sister. Cream of any crop. I knew she had to have a secret, and that I’d find it. Her beauty’s like an oil slick on water, covering an evil soul, and I watch through her keyhole as she lifts off her mask. That perfect face, not her own, in its locked glass case. I ran her bath; the herbs should make her sleep. I will have time. I’m nimble and quick, and I get the job done. So, yup. My time for writing flash fiction has gone down the tubes lately; I’ve been busy, and life hasn’t afforded a lot of creative time. This story (while I’m happy to have written it) really demonstrates that writing flash is much like using a muscle; if you don’t keep it warm and limber, you gradually lose the power in it. So, it’s not a great story. It took me far too long. But, nevertheless, I’m happy that it’s here, in public, and not rattling around my head. Have you checked out Warmup Wednesday! lately? This prompt image (along with the tight restrictions – 100 words, and include some sibling rivalry!) came from there. If you reckon you can do better (and, let’s be fair, you probably can), slide on over and let’s see what you’re made of. Happy writing, y’all. This entry was posted in Writing News and tagged 100-word stories, Aschenputtel, Cinderella, fairy tale retellings, flash fiction, Flash! Friday, prompt image, Rebekah Postupak, using image prompts in flash fiction, Warmup Wednesday on August 19, 2015 by SJ O'Hart. 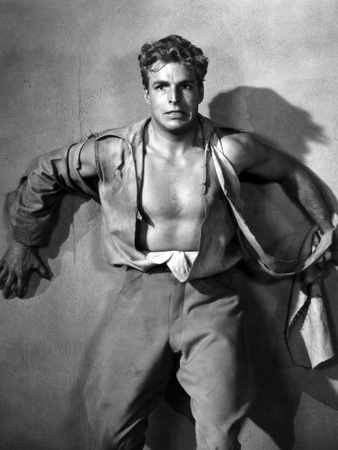 Buster Crabbe as Flash Gordon, promotional still from 1936. It’s there, in my mind, like a weed. This was too easy. She’s never left the cage unlocked before. Not even for her cigarette breaks, or to eat – though she doesn’t eat much, now. But this morning she rose from her desk, mid-sentence, a ribbon of smoke rising from her ashtray, and left the room. Oh, Zeus. She’s coming! It’s been so long since I was loose that I can’t remember where I am, or where to go. I must hide! But she keeps me in rags, barefoot, and anyway I may not leave this dwelling. Separated from her, I will die. Is that irony? I should know. Every writer needs a Muse, and I am hers, soul-bound. She doesn’t need to cage me, but she can’t trust me to stay. I reach a dead end. I turn, desperate, but she is behind me. ‘There you are,’ she croons. ‘Enjoy your run? Had to get your blood up, somehow. You’ve really been underperforming lately.’ Her smile is a sudden blade. Ah, me. My fatal flaw? Plot twists have long been my undoing. So – yay! This piece of flash fiction has taken me *hours* to complete, but hey. I finished it. It’s mine! I did it! It’s been so long since I entered any sort of flash fiction competition that I half-expected never to complete a piece again, so I’m glad I proved myself wrong. My old brain cells aren’t firing on full power, as is clear from the Titanic struggle this story caused within me, but heck. A challenge ain’t a challenge if it ain’t hard, right? 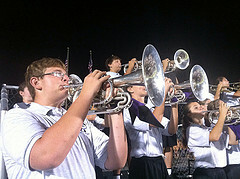 This entry was posted in Writing News and tagged flash fiction, flash fiction competition, Flash! Friday, image prompts, Rebekah Postupak, short stories, stories, story prompts, using story prompts, writing on June 26, 2015 by SJ O'Hart. 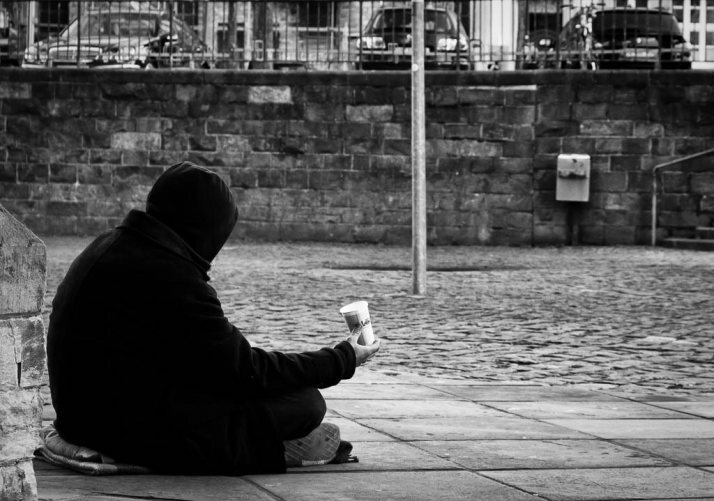 Image: The Beggar. CC 2.0 photo by Foto_Michel. I settle, cross-legged, on the pavement, my sleeping bag furled beneath me. I hold out my empty cup, trying to remember coffee. I run my dry tongue over my film-coated teeth. But, I remember: I chose this. There’s no going back. They clip-clop past me in their heels and polished brogues, with their suits and their pretence. I feel like sticking my leg out and tripping someone, just to see. Just to see if they’d see me, then. But I’ve worked hard to be invisible. She stops unexpectedly. Smiling. Tall. Expensively slim. She smells good. I don’t know her, yet I know. How has she found me? ‘It’s time, Agent,’ she says, crouching. She says nothing. Her gaze skewers me. ‘But I left,’ I tell her, my false grin dying. As she walks away, I gaze into my still-empty cup, and sigh. I suppose a small advance would have been too much to ask? This week’s Flash! Friday challenge was to create a mini-tale from the prompt image, above, which also had to include a spy. Well, I included two, even if one was off-duty (though, as the story asks, is one ever off-duty if one is a spy? Anyway). I wrestled with this piece of flash, just a bit, and I’m glad to see that I beat it into submission, even if it’s a bit of fluff, really, which doesn’t say very much. At least, dear readers, I wrote it, and for that alone I’m glad. By the by, have you ever thought about entering a Flash! Friday challenge? Well, if you never have, this might be the week. There’s a special prize on offer today – as well as being in with a chance of winning, you might also win one of two Golden Tickets to take part in the next FlashDogs Anthology. I already have one, so you’d be joining me and a host of other wonderful folk in a great celebration of all things flash, and indeed, fiction. Give it a go. 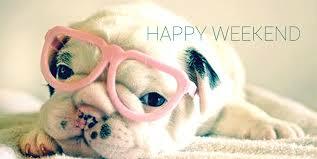 The weekend is nearly here, and I hope a good one awaits you all. May it be wordy and bright! This entry was posted in Writing News and tagged flash fiction, flash fiction anthology, flash fiction competition, flash fiction prompts, Flash! Friday, Flash! Friday microfiction, Flashdogs, Golden Ticket, using image prompts in flash fiction on April 10, 2015 by SJ O'Hart. So, the wheels have fallen off my blogging, as of late. I had a very busy week last week (saving the world, conquering planets, bringing peace to the masses, all the usual stuff) and I didn’t even have a chance to read. I know. I can barely bring myself to believe it, either. So. Here we are, on Saturday, and there’s no book review. As a means of mollification, I could direct you here to a short interview I gave with Flash! Friday during the week. My tenure as champion is blissful, but short; over the course of the weekend I’ll be judging the current competition and choosing a new winner. It’s sort of bittersweet, yet fitting. I could also direct you to this Tumblr blog, which is dedicated to a very wonderful topic. I didn’t create it, so I can’t really take any of the credit, but I’m hoping it might distract you all from my own complete uselessness this week. Monday next is a Bank Holiday here, and I can’t guarantee I’ll be conscious in time to blog, but I’ll do my best. After that, it’s anyone’s guess. Stick with me! There’s never a dull moment here at Clockwatching… HQ. This entry was posted in Book Reviews, Musings and tagged blogging, book review, book reviewing, busy life, Flash! Friday, Flash! Friday microfiction, losing control, weekend on April 4, 2015 by SJ O'Hart. Y’all will have to forgive me a little horn-tooting here, this morning. Not that I’m one to brag, normally, but when a long-time goal is achieved, I think it deserves a little mention, don’t you? So, on Monday, the winners of last week’s Flash! Friday were announced. You might remember, if you’ve been paying attention, that I actually managed to dredge a story out of my brain last Friday and submit it on time. It was one of those moments where the prompts struck off my inspiration like a tuning fork, and I thought: Hmm. Yes. I think I know what I’ll write about here. Of course, I was convinced of two things: one, that the idea I had would be used to death by other people (and written about much more effectively) and two: that I would come nowhere near the winners’ podium, as it had never happened before. (Well, I’ve been Runner Up a few times, but that’s not the same). Not that winning is the point, kids. It’s not. Taking part is the best bit, and creating a new story out of nothing is pretty fantastic, too, and that’s not to mention how great it is to get to share that story with so many other wonderful writers, all of whom are just trying to improve and have a bit of fun while they’re at it. That’s what’s important. (But, come on. It would be nice to win, just once. Only human, and all that). So, I took my twisty little idea and I crafted a short tale out of it, and I sat back and told myself it was actually pretty decent. Not the best piece of flash fiction ever written, but certainly one I could stand over and be proud to call mine. And so, I did the necessary, got it submitted, and went about the rest of my life. And then, after a very long and very hard day on Monday, a whole pile of Twitter notifications started to pop in. So, intrigued, I checked. And. I had been and gone and done and won the darn thing, for the first time, after two years of competing. Better late, I can tell you, than never. My story, Judge, Jury, Executioner was judged the best of the stories entered for last week’s competition, and I was really, truly delighted. I was delighted firstly to have been judged the best by my peers for that week, but I was even more delighted to have won the competition with a story I really liked, and one which meant something to me. It’s a feeling like no other when you get an idea, and you feel it transmuting in your mind as you think about it; a deep level of your consciousness knows what to do with it, and starts to form it into something else, something you didn’t expect, before your very eyes. Things you’ve read, or heard, or dreamt of, all come to bear on one tiny piece of fiction, and it pops out of your fingers like something which has always existed, and you just know this is a story. This is something which owes its roots to the culture in which you were formed, but which is new, and fresh, and which is adding a different thread to the tapestry. Judge, Jury, Executioner is, for me, a story like that. It’s only 209 words in a very big internet. It’s a tiny artefact of culture which will fade and be lost before long, like everything we humans create. But, for now, it exists, and I’m proud of it. But life goes on, as go it must, and I have many things to do today, so I’ll have to hurry you up. I’m only going to be signing autographs for the next hour or so, okay, so get in line and wait your turn, all right? Make sure to have your name written out clearly on a piece of paper so that I don’t actually have to ask you how to spell it, because we big-shot writers can’t be doing with anything like that, you understand, and I’ll get to you eventually. This entry was posted in Writing News and tagged achieving a long-held goal, flash fiction, Flash! Friday, Flash! Friday microfiction, Judge Jury Executioner, perseverance in your writing career, Rebekah Postupak, winning a writing competition on April 1, 2015 by SJ O'Hart. 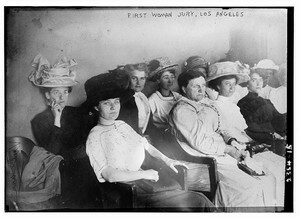 First woman jury, Los Angeles, 1911. Public Domain photo by the Library of Congress. He looks so fine up there, his head thrown back, a thick pulse thudding at his throat. If it weren’t for his shackles he could almost be in church, a pillar of righteousness. But instead he’s in the dock, and I’m here. The judge reviews the evidence, making it sound even more damning than the prosecution had. Gruesome injuries, he drones. Overwhelming strength. I tremble, but the defendant doesn’t hang his head; he stays straight-backed, his eyes fixed in the crowd, on one face in particular. I don’t have to look to know which one. When I caught my husband sneaking out at night, I did nothing for the longest time. I waited. I chose my moment carefully, following on silent feet. When I saw him embrace another man – this man, whose life I’m about to judge – a rage like hellfire filled my bones and blood. So I crept to his house. I murdered his wife. It was as if a demon overtook me. And when they dragged him to trial, this fine innocent man, he confessed. To spare my husband, he confessed. To spare me the shame. Like a coward, I rise and condemn him, and his eyes never leave my husband’s face. This week’s Flash! Friday (which I heartily recommend you try) asks participants to write a story between 190 and 210 words (I barely scraped in!) based around the image prompt, above, and the ‘concept’ prompt of ‘Man vs. Self’. The image prompt was of a jury of women sitting in judgement, and perhaps it’s because of my love of folksongs with their dark, twisty deeds, but the first place my mind went when I thought about interior conflict was this: what if you were judging someone for a crime you knew they hadn’t committed, but you had no choice but to convict them? Well. And so, this tale was born. Again, I make no claim to have written a ‘good’ story. It’s a story which didn’t exist an hour ago, and that – for me – is enough. I’ve been finding story-writing tough lately, and so any week in which I can get a story to coalesce long enough to capture it is a good one. Let’s hope it’s a good sign for the rest of the day’s endeavours! Alors, my loves. I must fly. Happy weekend, one and all, and make sure to do some creative thinking over your down-time. It can only be, I’m assured, a Very Good Thing. This entry was posted in Writing News and tagged convicting an innocent person, flash fiction, Flash! Friday, Flash! Friday microfiction, inspiration for short story writing, microfiction, murder trial, short story, using image prompts in flash fiction, writing on March 27, 2015 by SJ O'Hart. 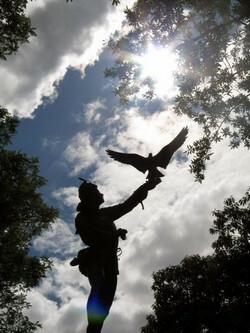 The Falconer, Central Park, New York City. CC2.0 photo by Matt Karp. There was a time I relished your captivity. Rules. Regulations. Proscriptions. Thou shalt not. It was safe. I was a bird in the hand, watching the world, unwilling or unable to fly. One blue day, I leapt and was carried, and the sky took me, and it was good. Better than had been promised. Things were different from up here. I called to you, but you couldn’t see. You wouldn’t. You wait for my obedient return, my bowed head, my supplication. I hear your voice calling, I feel the old pull, but my head bends only to the wind, now. One of Flash! Friday’s new initiatives is Warmup Wednesday, where participants are asked to write a story of exactly 100 words (no leeway!) based solely around an image prompt. The stories are not judged, and so it’s purely for the fun of creating something new. It’s been so long now since a prompt actually kicked anything off inside my brain that when I saw this image, and it chimed exactly with how I was feeling, I knew I had to write. I did, and I’m so glad. Because, guess what? It really made me feel better. A story is, of course, about whatever a reader wants it to be, and I hope that anyone who reads this particular piece will take their own meaning from it. But, personally, it has come from a very deep place of anguish and uncertainty, born out of comments recently made in the media by an Irish Catholic bishop, which shook me to my foundations and made me sick to be a person of faith. It is harder and harder with every passing day, it seems, to be a person of faith in modern Ireland, and to feel the beliefs which have always sustained you slipping away, one by one. I’m not sure what this story ‘says’, but all I know is I’m glad I was able to get the impulse to create it out of my head. And now, on with your Wednesday. Have a good one. Do some writing, maybe. This entry was posted in Wednesday Write-In Entries and tagged captivity, Catholicism in the media, flash fiction, Flash! Friday, Flash! Friday microfiction, image prompts, Irish Catholic, Roman Catholic church in Ireland, using image prompts in flash fiction, Warmup Wednesday on March 11, 2015 by SJ O'Hart.